I’ve sort of become a water warrior lately. It all started with a visit to my girlfriend’s hometown in the Florida Panhandle, where she taught me how to kayak. 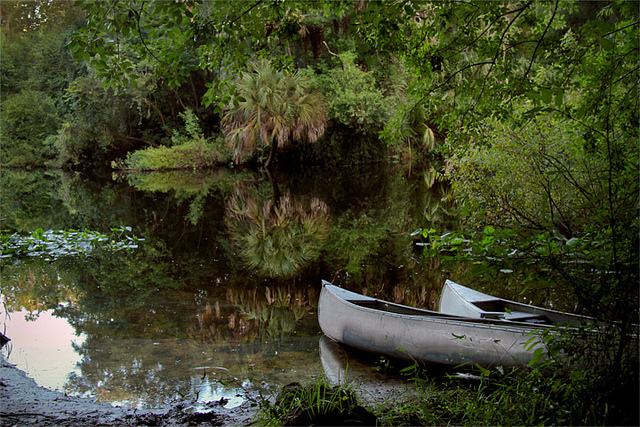 A week later, she and I were back in my Central Florida hometown to celebrate my sister’s birthday – during which we took a canoeing trip down the Hillsborough River near Tampa. I was unsure about how I would fare in a canoe, but given that I did not (amazingly) flip over the kayak the week before, I was fairly confident about the idea of extending my newly formed sea legs inside the hull of a canoe. My family and I all checked in at Canoe Escape at John B. Sargeant Park, a longtime Thonotosassa (near Tampa) canoe rental operation on the Hillsborough River, at 9 AM and met with the owner. There were six of us in our group, and my sister, girlfriend, and I went in a single canoe. While my girlfriend definitely knows her way around boats (she grew up with them! ), the party ended up putting me in the rear of the canoe – the captain position. “Oh boy, how it this going to go?” I asked myself as the canoe rental staff helped us learn our way around the canoe and also how to control it in the water with our paddles. It is advisable to take a canoeing course so you learn how to properly maneuver in the water. Wear your life jacket! Whether you’re a champion swimmer or you’re afraid of the water, it’s not hard to drown when your canoe flips over and you’re suddenly in panic mode. When you’re canoeing in Florida, you need to remember that you have a very strong likelihood of encountering alligators. Stay inside your canoe and do not interact with the wildlife. Determine the course you plan to take, and make sure that your entire team knows where you all are going. If you aren’t canoeing back to your point of origin, be sure you have a party ready to pick you and canoe up once you’ve reached your destination. 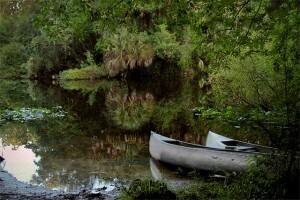 Even when canoeing in Florida, you’re bound to encounter plenty of chilly waters in the late fall, winter, and early spring. Wear a wetsuit if the water you will be canoeing in is 60 degrees Fahrenheit or colder. You should wear bright clothing so you can be more easily seen by other vessels; at night and during other low-light conditions, you will be required to show a white light toward oncoming traffic. Don’t block oncoming traffic – not only is this a safety rule, it is also a matter of courtesy to others who may be navigating in the waters around you. We launched into the water, and down the river we went. While I initially had a difficult time getting used to articulating the paddles correctly to steer the canoe, I quickly became very comfortable in the canoe and began taking in the sights around me. Being 15 miles from downtown Tampa, there were nearly no signs of development around us – just cypress, palmettos, and oak trees about as far as the eye could see. Within 20 minutes of our 3-hour excursion, we saw our first alligator – and already plenty of fish, turtles, and birds. Yep, this is Florida, and as you may know, gators in the Sunshine State aren’t only found at roadside wildlife zoos – they are just about everywhere here! There were some mild rapids, which are actually a rarity for the state; the Hillsborough River is located on Florida’s southernmost outcropping of Suwanee limestone, which causes the river’s rapids. The mild rapids, however, were nothing that we couldn’t handle. The toughest portion of the canoe trip was getting around a fallen cypress tree that was partially submerged just below the water’s surface. Our canoe’s hull got caught on a portion of the trunk that was laying only a couple feet below the water line. Edging the canoe over the top of the fallen trunk was definitely a five-minute workout, but we managed to pass the obstruction with a lot of paddling, shifting our body weight around the inside the canoe, and a dose of prayer. After we got past the fallen cypress, it was clear sailing (er, paddling) beyond that point.